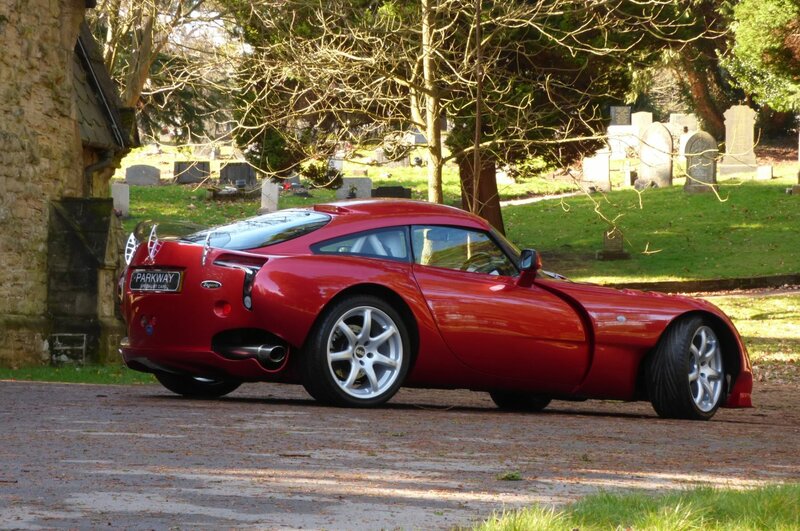 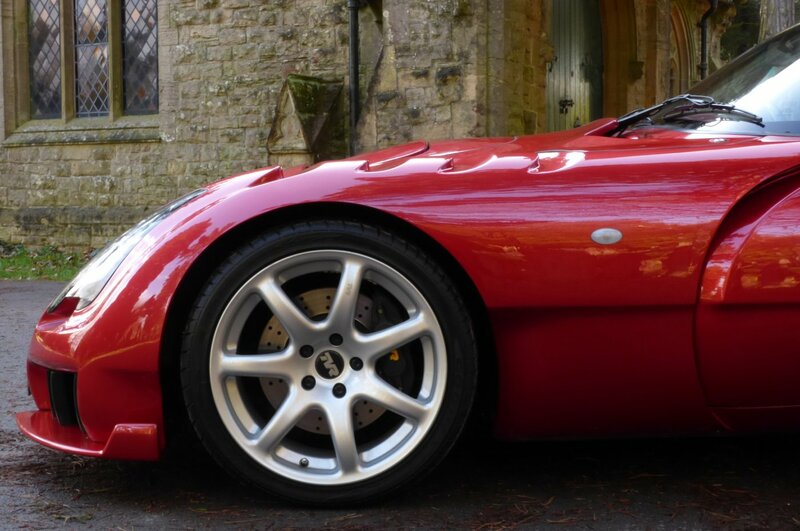 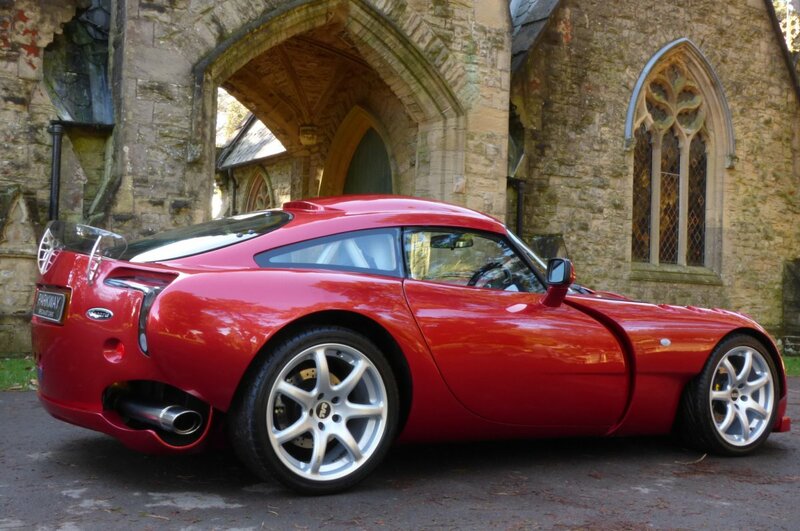 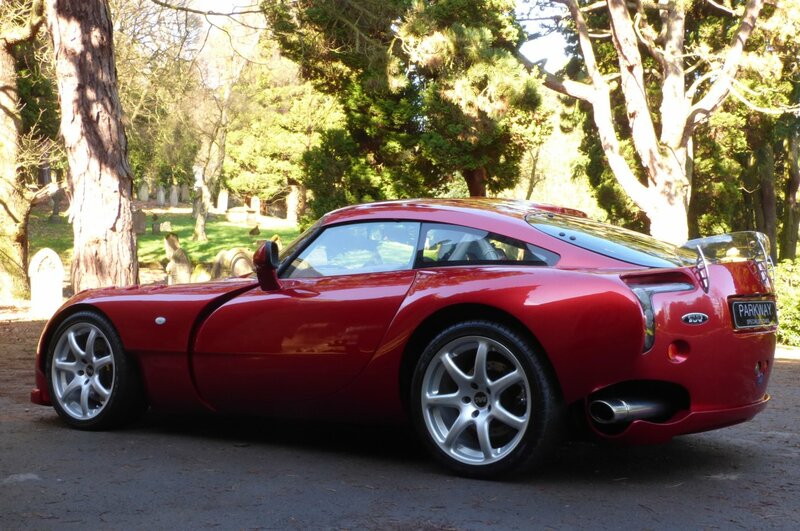 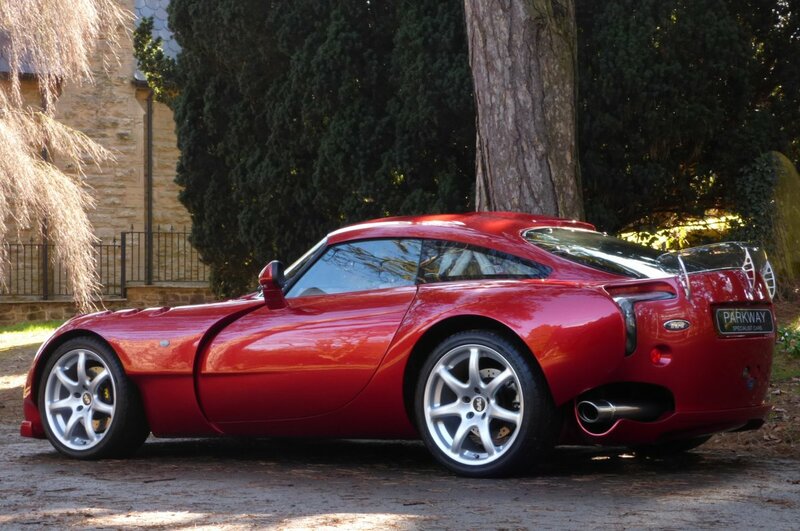 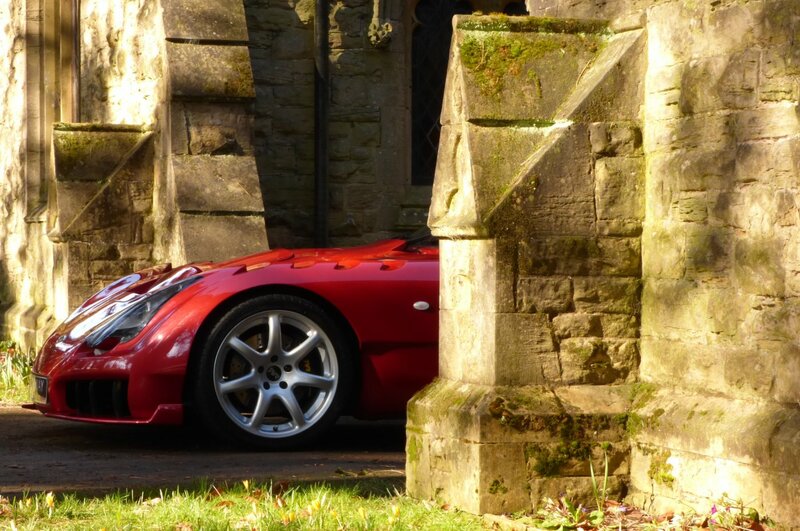 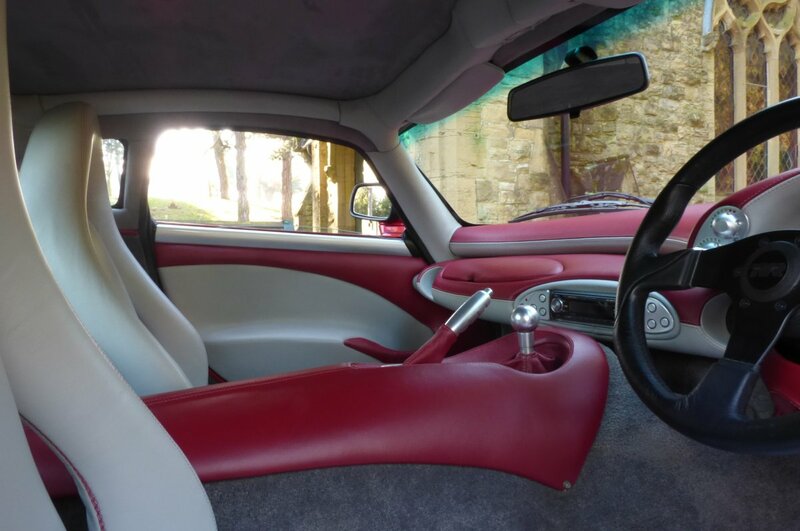 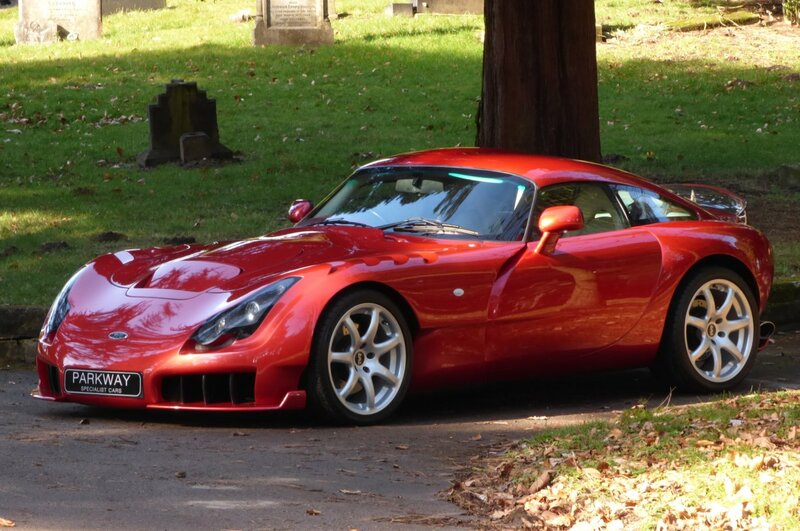 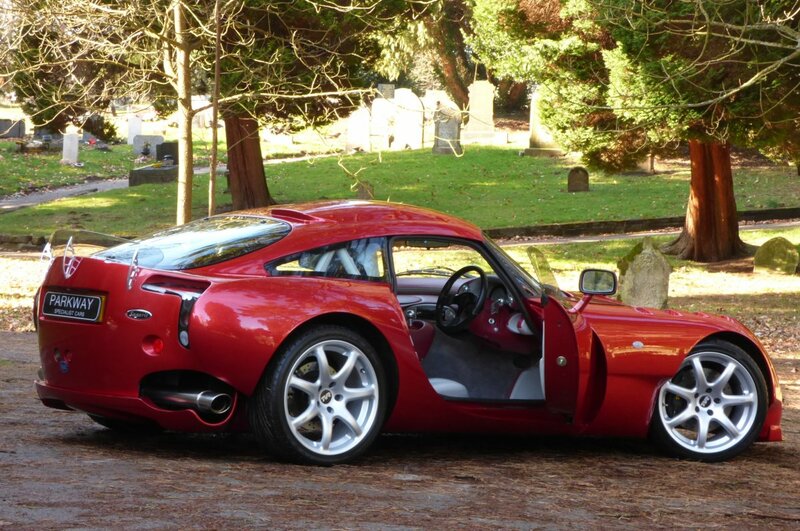 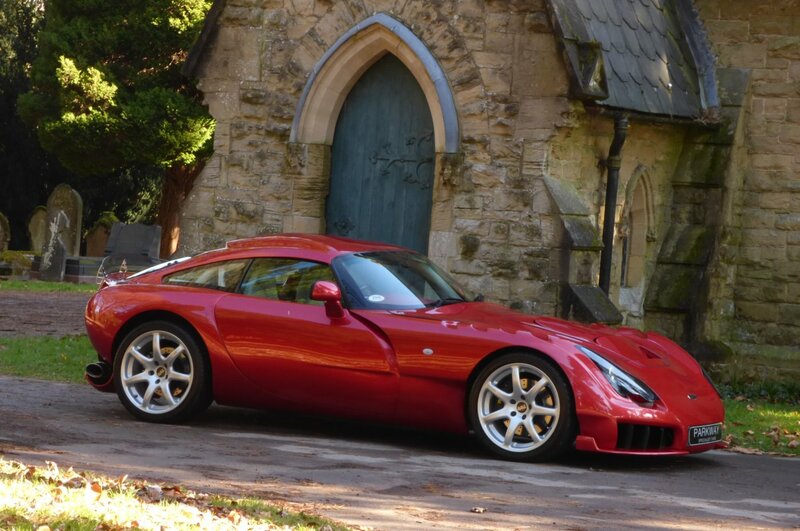 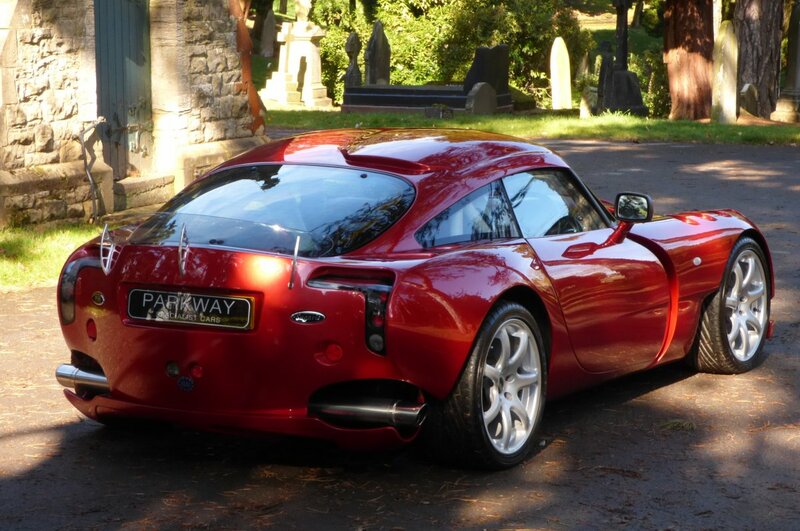 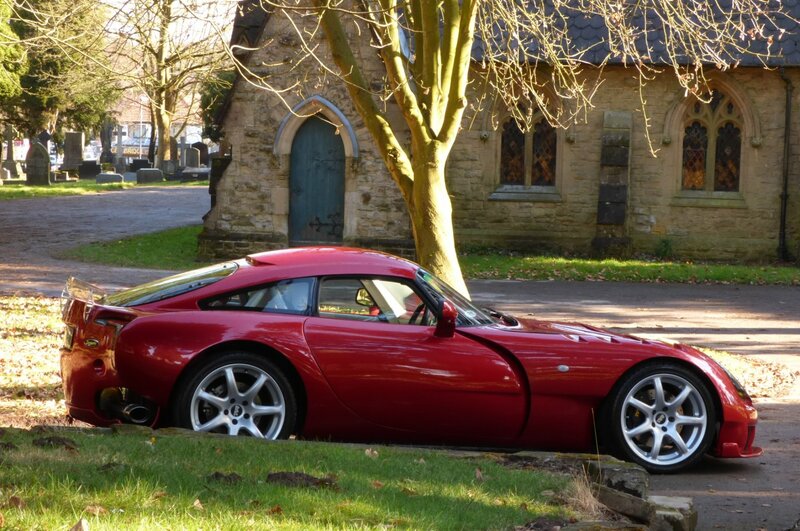 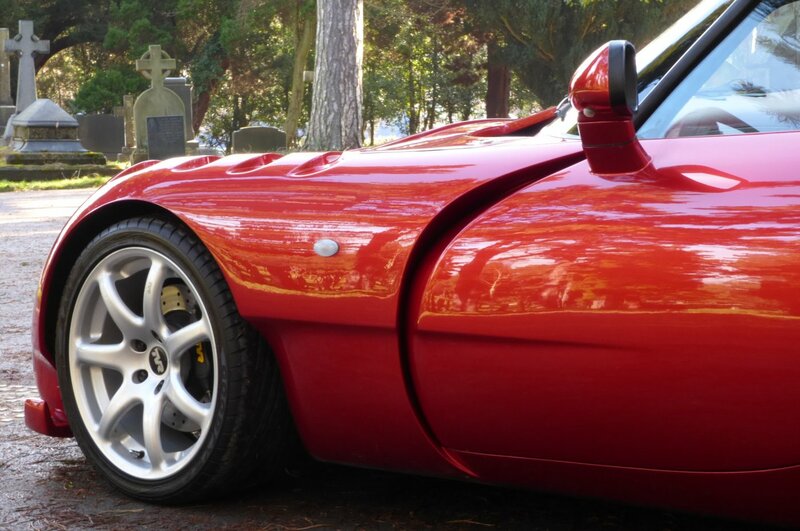 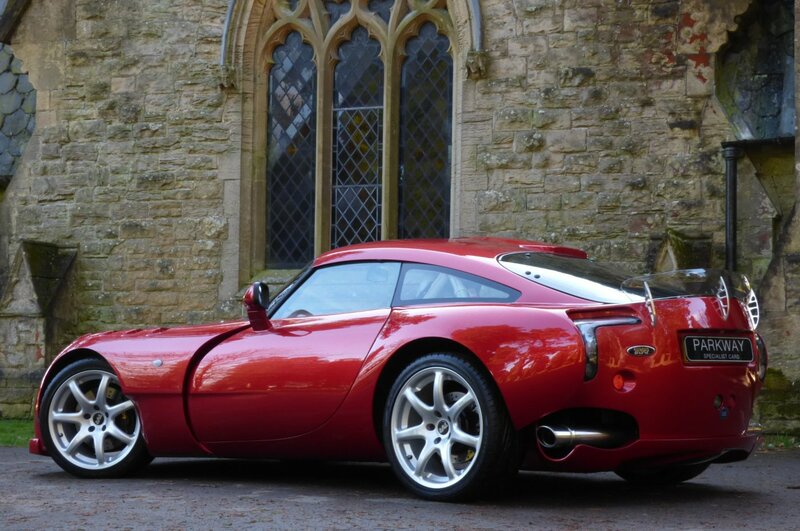 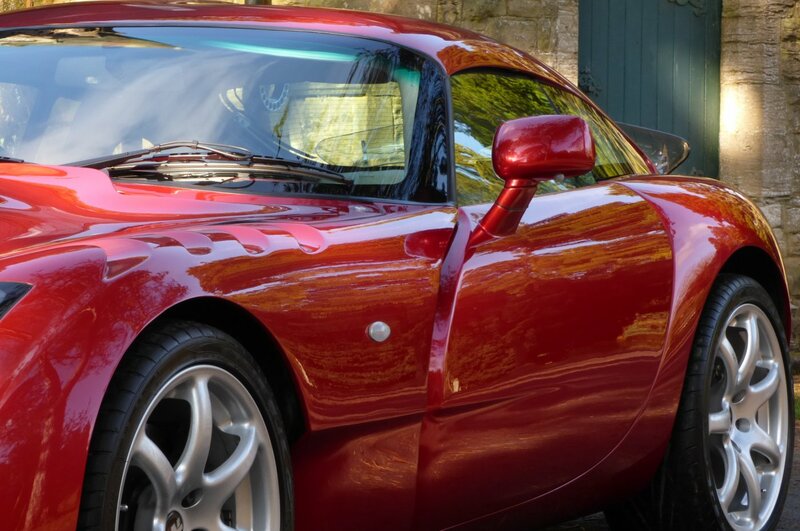 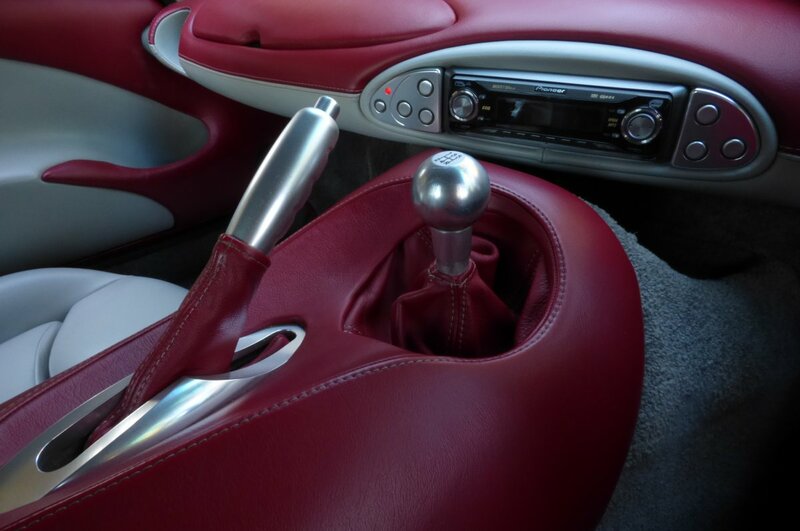 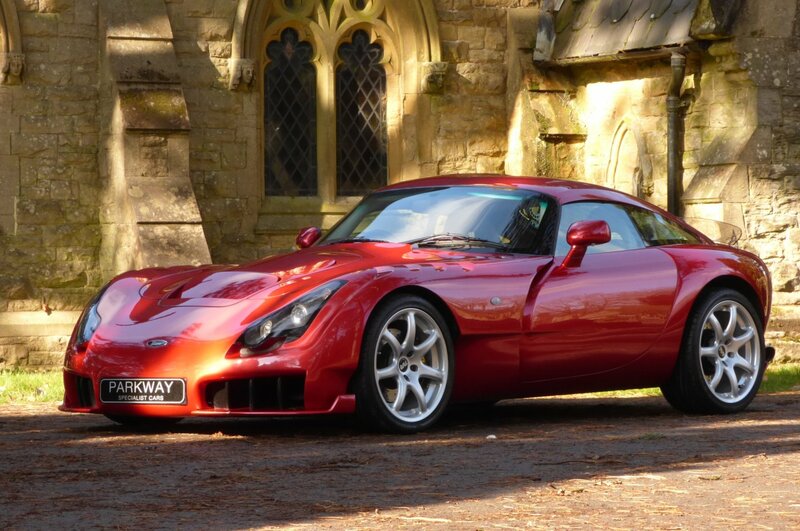 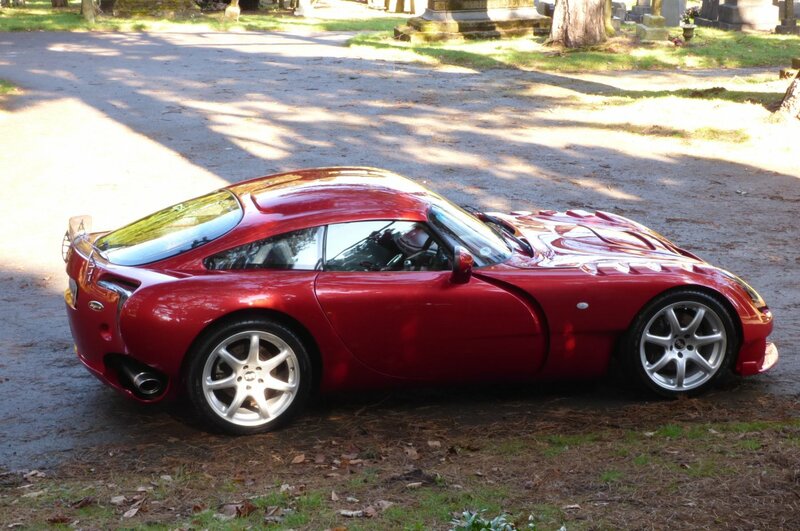 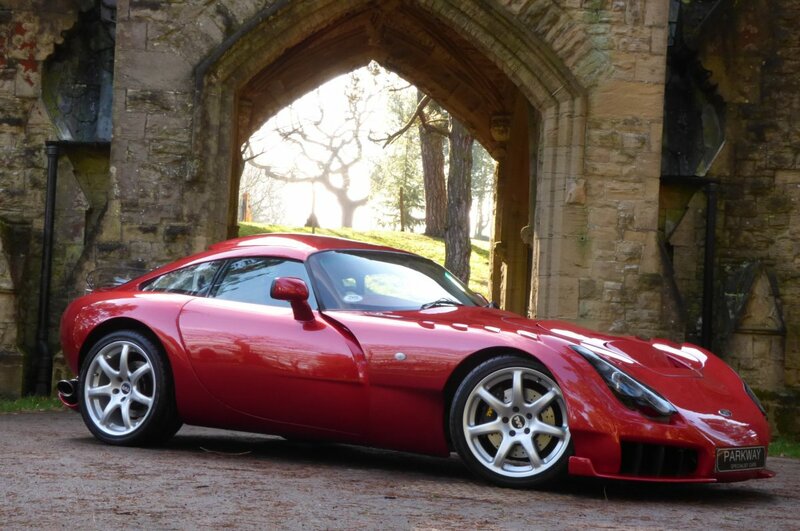 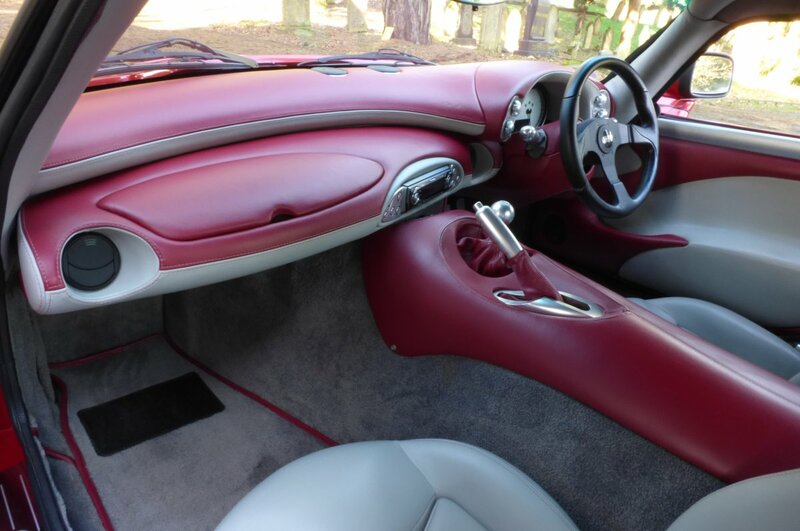 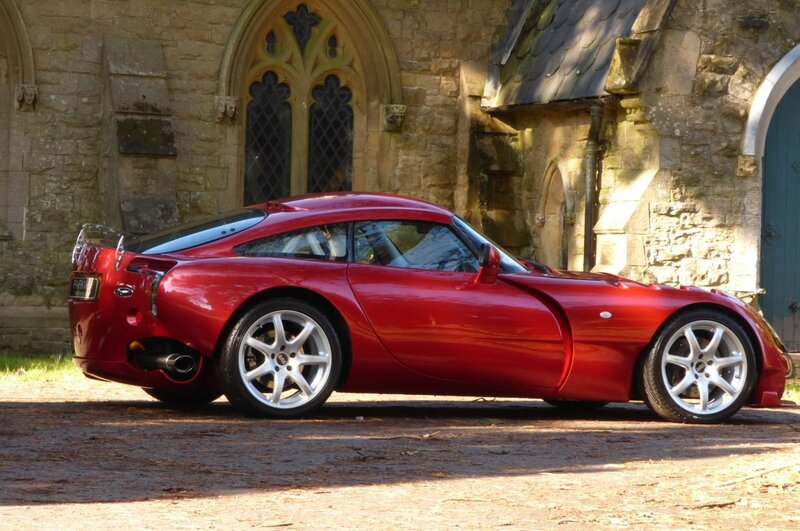 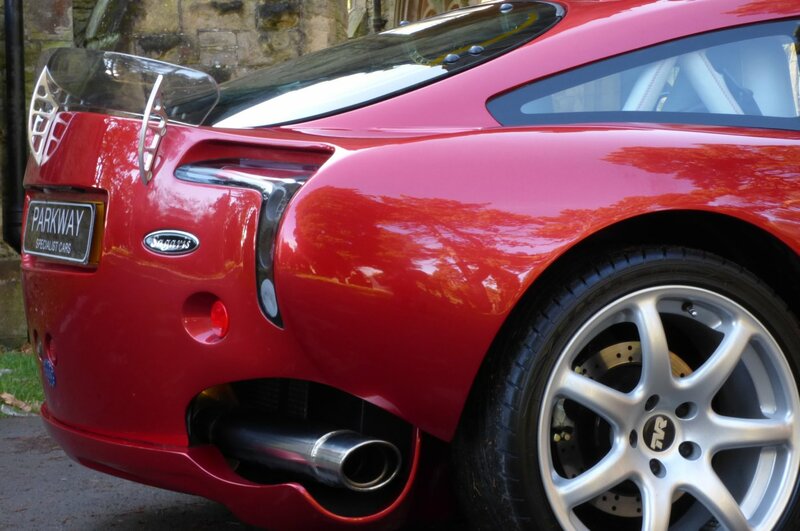 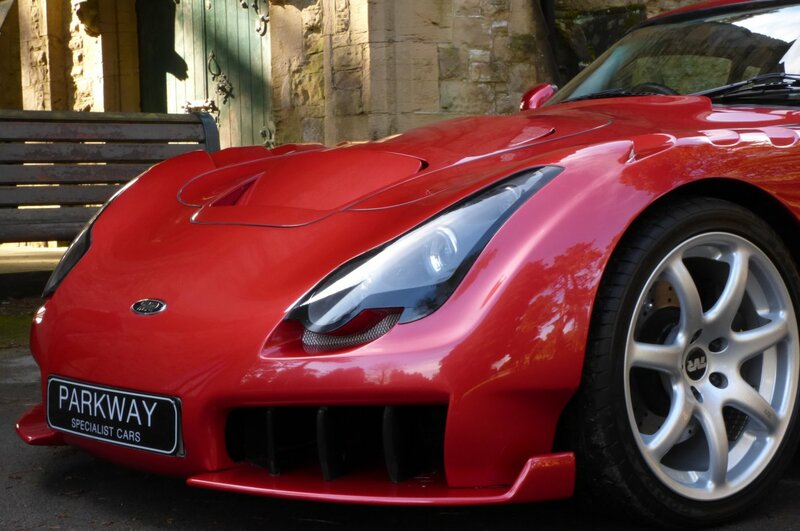 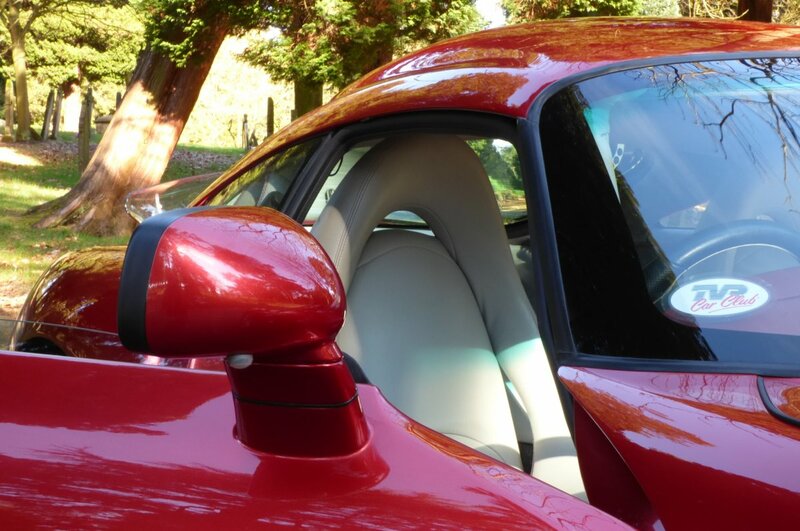 The Blackpool Based TVR Motor Company First Offered The Sagaris To The Motoring Press At The 2003 MPH03 Auto Show And Then Was Further Showcased A Year Later In 2004 At The NEC Birmingham Motor Show, With Order Books Fully Opened And The First Small Numbered Vehicles To Become Available To The Lucky Few In 2005. 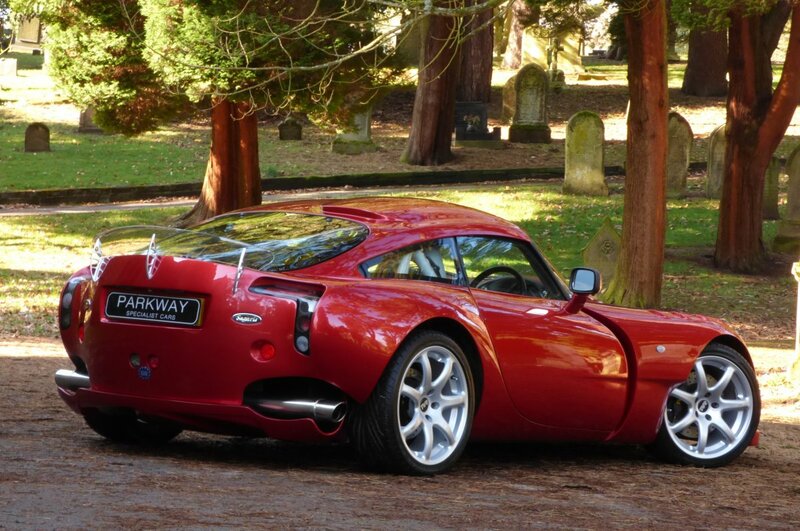 Even Tho The Factory Never Documented The Exact Total Built Of Cars, There Are Reports That Only A Mere 211 Units Had Been Produced And Sold Between 2005 To 2006 And If We Fast Forward To 2018, The Total Number Of Vehicles Still Available To Acquire Are Very Few And Far Between, Thus Making This The Ultimate British Modern Day Classic Super Car. 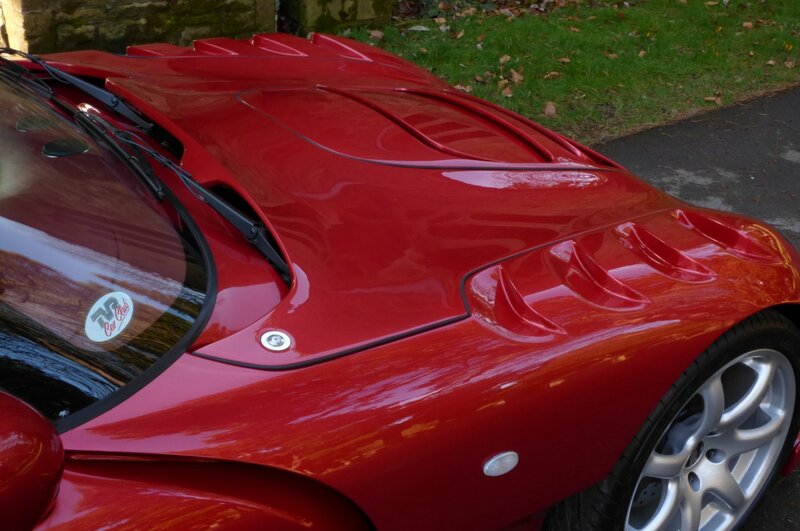 The Radical Design Came From The Perfect Collaboration Of Factory Designers Graham Browne & Lee Hodgetts, Who Both Wanted This All New Offering To Be Endurance Racer, Yet Sadly The Sagaris Was To Be One Of The Last Models That Would Be Produced From The Lancashire Sea Side Assembly Line And With The Aggressive Sculptured Body Curves And A Multitude Of Air Vents, This Fabulous TVR Was To Set The Heart Beats Racing For Those Purist Of Petrol Heads, That Wanted Their Own Piece Of British Hand Built Excitement. 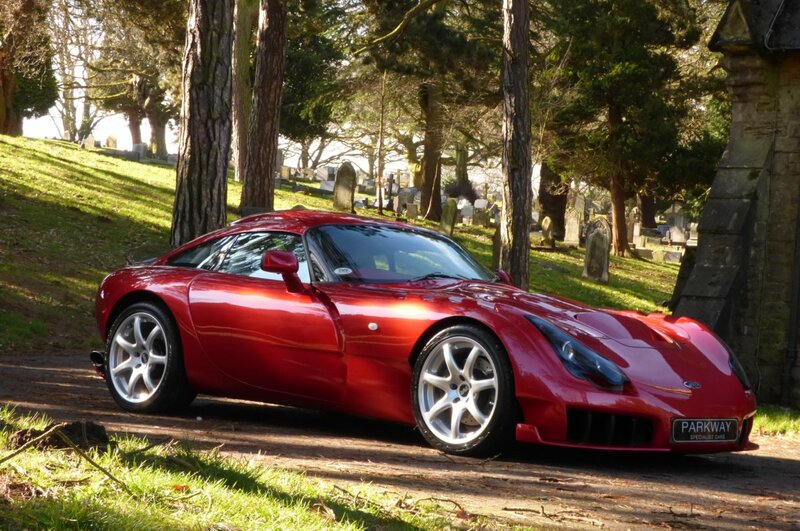 Every Element Of The Car Was To Create Maximum Aggression And Fear To Other Leading Car Manufactures, With The Vehicles Name Sagaris To Come From The Greek Lightweight Battle Axe Used By The Formidable Warriors Known As The Scythians, Which Was Feared For Its Ability To Penetrate The Armour Of Their Enemies. 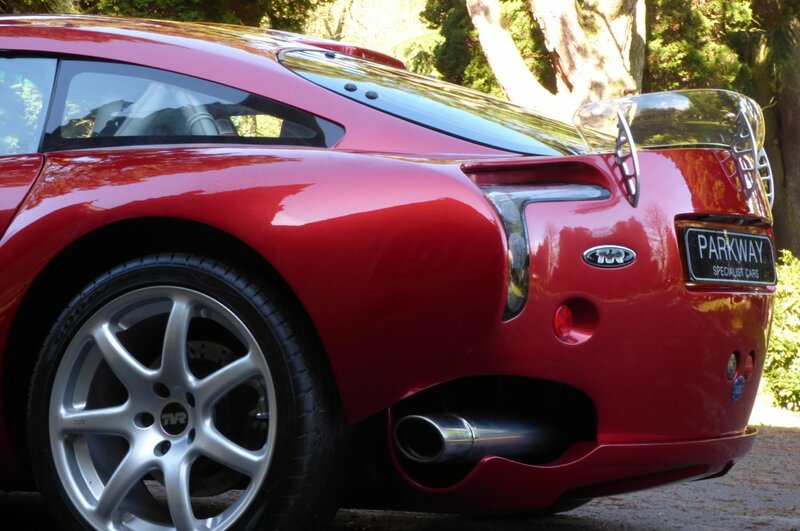 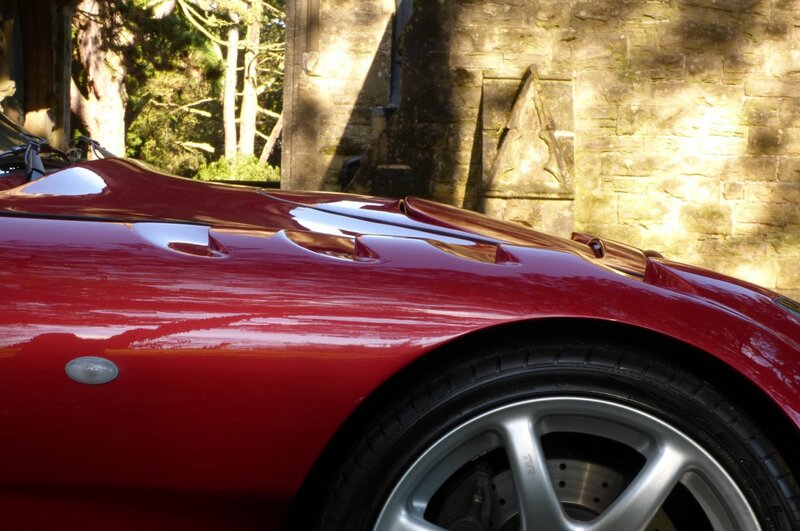 At The Time Of Build The TVR Brand Was Under Russian Ownership, With The Young Oligarch Nikolai Smolensky, Wanting To Make His Mark On An Already Established Performance Manufacture, So He Wanted To Improve The Final Finish And Build Quality, That Had Been A Down Fall From Many Past TVR Cars Dating Back To When The Company Was First Founded In 1946. 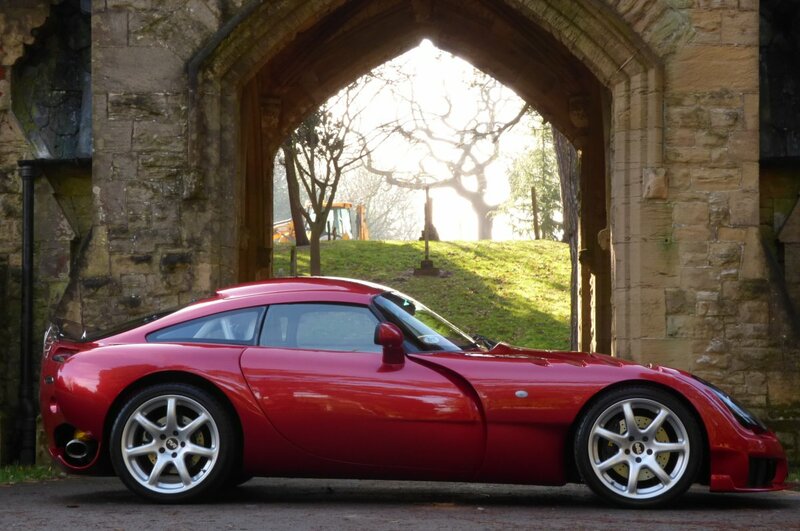 TVR Chief Engineer Daniel Boardman Was Also Frustrated With Historical Factory Build Issues And Was Tasked With The Job To Over See The Wishes Of His New Boss, So He Looked To Improve Problems With Water Ingress, Poor Fitment Of Interiors And The Sometimes Scary Vehicle Handling, Which Had Made Drivers Slightly Nervous To Even Consider A TVR As An Option To Purchase. 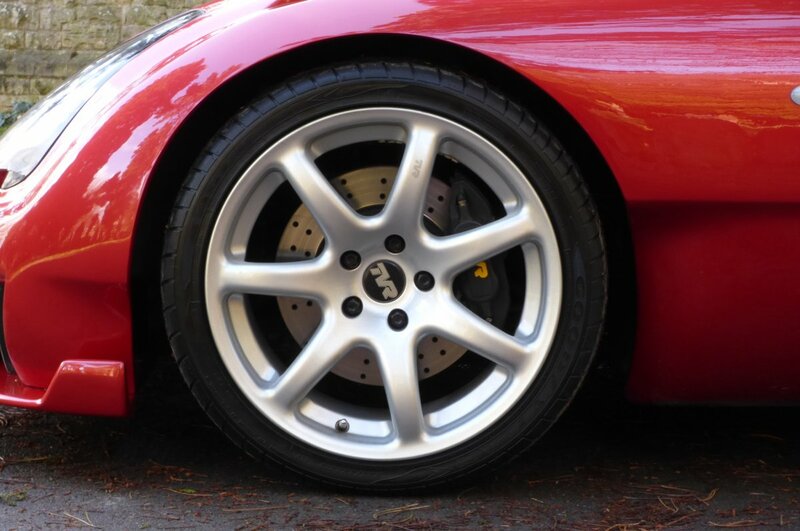 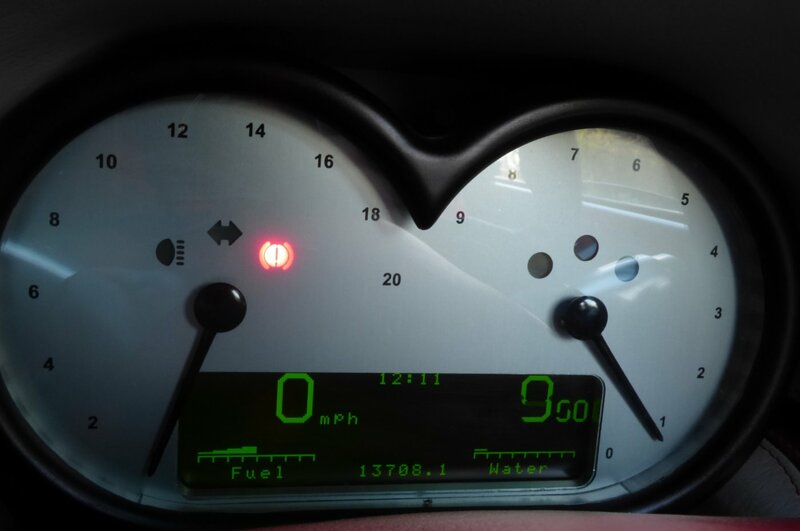 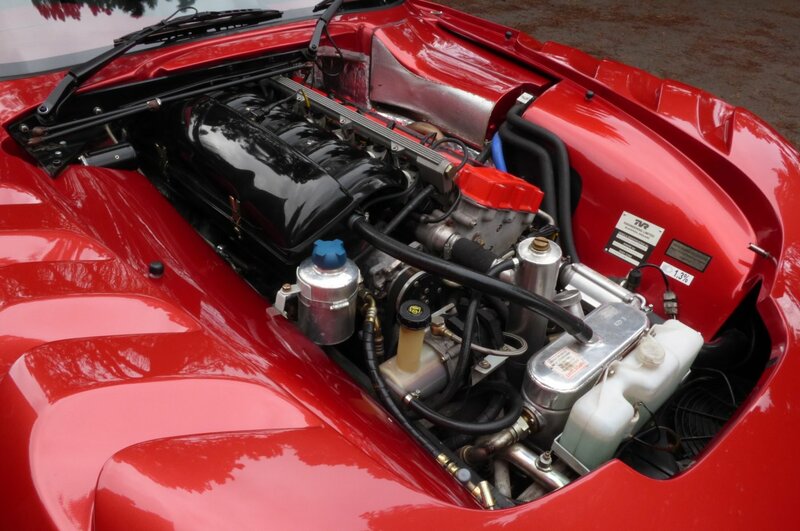 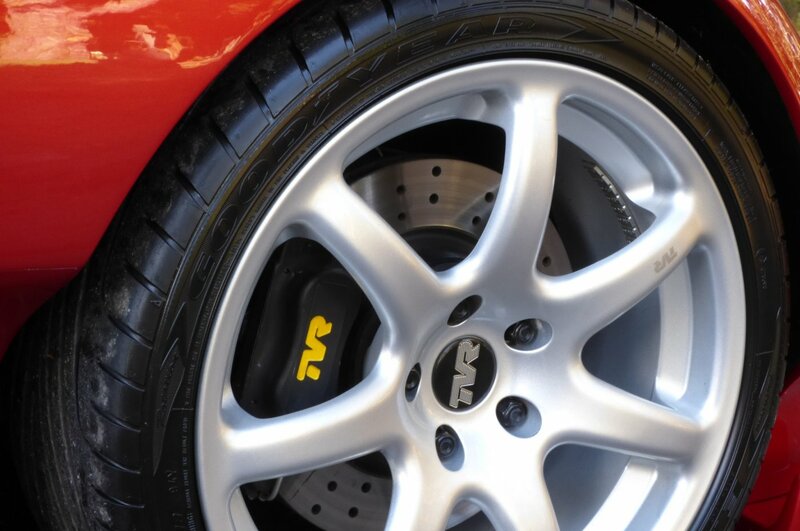 So Mr Boardman Improved The suspension Which Eliminated Bump Steer, The Dampers Were Tuned With Input From The Bilstein And Multimatic Concerns, The Bonnet Was Redesigned To Work As Well As Any Conventional Steel Bonnet And The Door Seals Were Meticulously Checked To Ensure No Water Ingress. 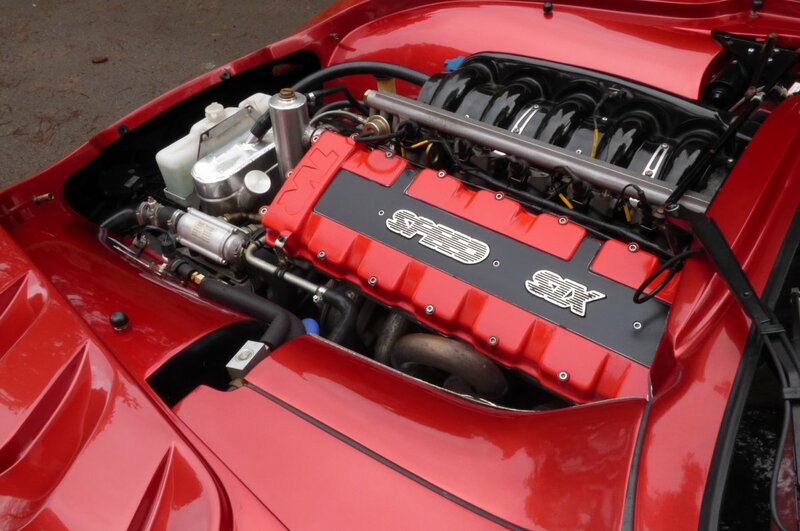 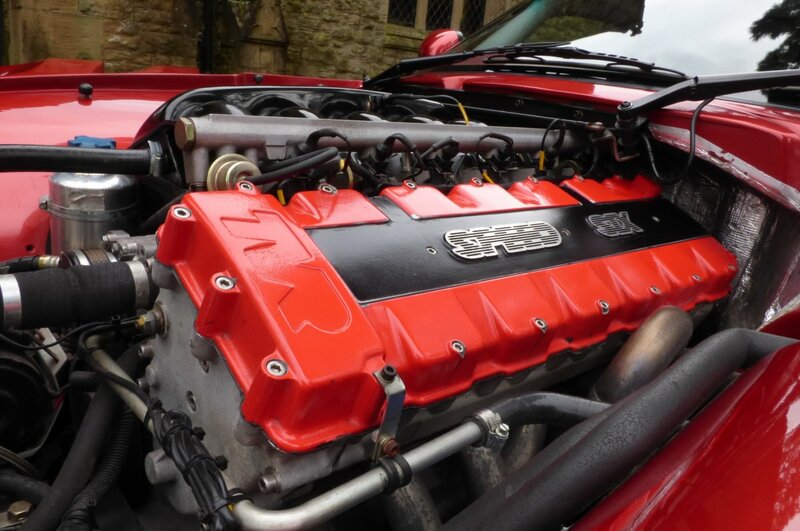 The Immense Power Came From The Four Litre Speed Six Engine Which Produced An Impressive 406 BHP Between 7000-7500rpm And 349lb ft Of Torque At 5000rpm, Which Would Accelerate Both Driver And Passenger From 0-62 MPH In Just 3.7 Seconds, Would Brake From 60-0 MPH In An Astonishing 2.9 Seconds And Then Would Further Climb To A Top Speed Of 185 MPH, With The Final Party Piece Being Offered From The Thunderous Noise, Generated From The Chromed Sided Exhaust Pipes. 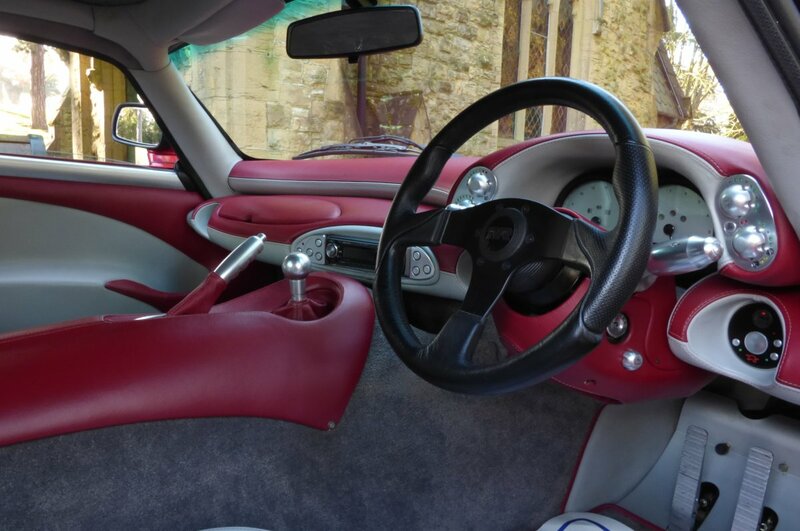 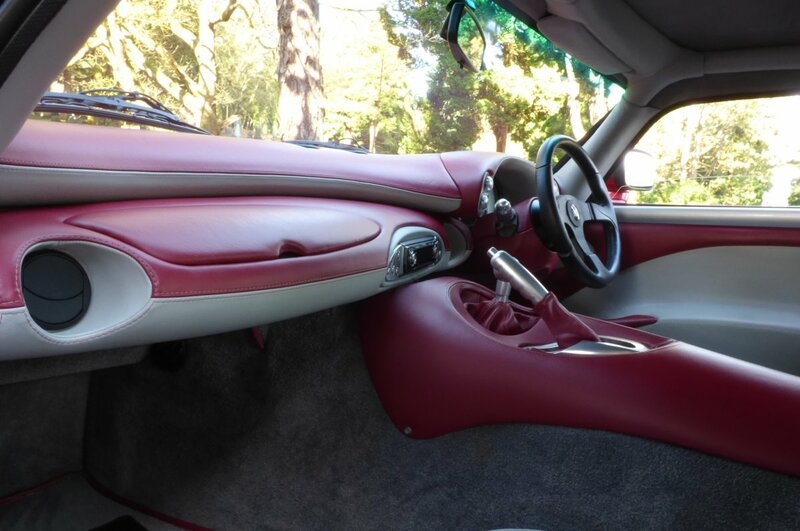 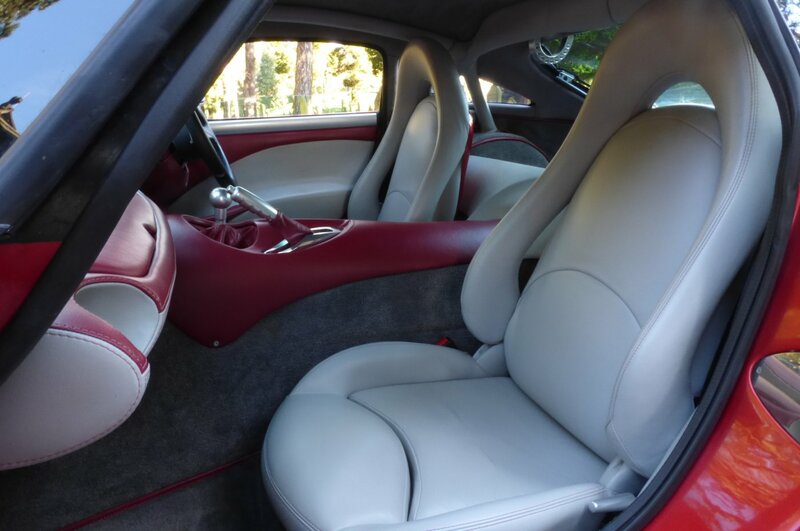 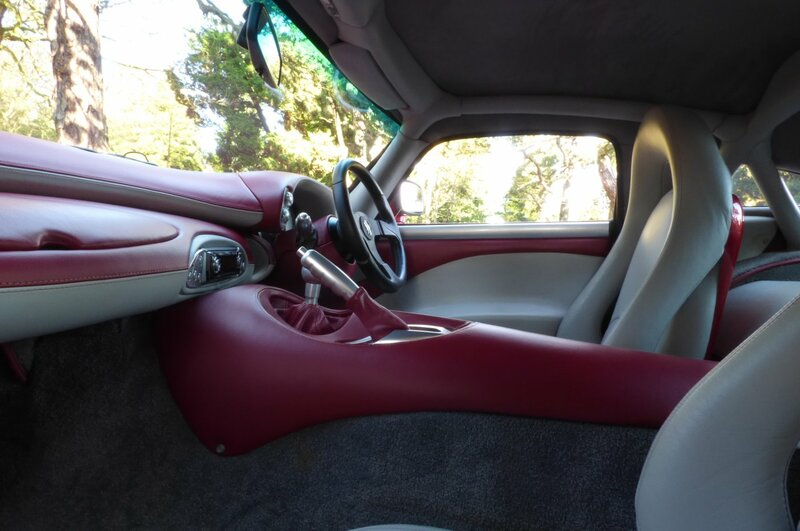 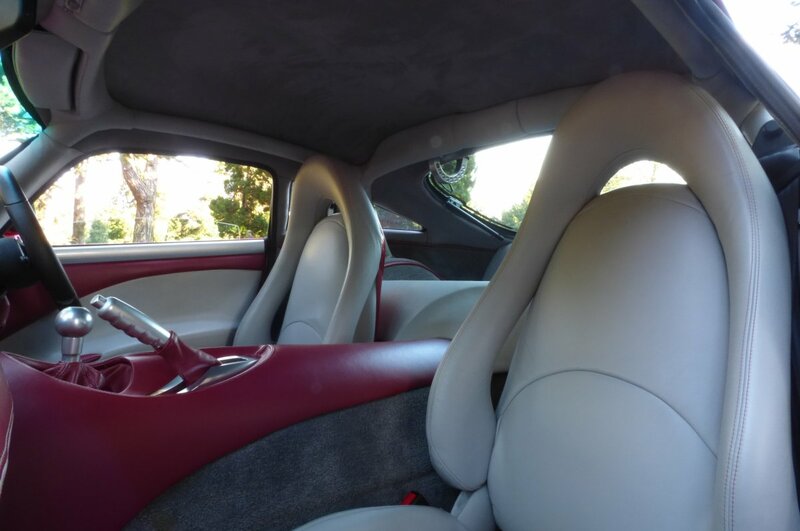 The Interior Design Follows The Same Suit As The Radical Exterior, With A Total Cabin Designed For Sheer Excitement And Driving Pleasure, But Still And Possibly More Surprisingly A Snug Interior That Offers High End Comfort, With Subtle Metal Turned Detailing, That Announces Its True Intent. 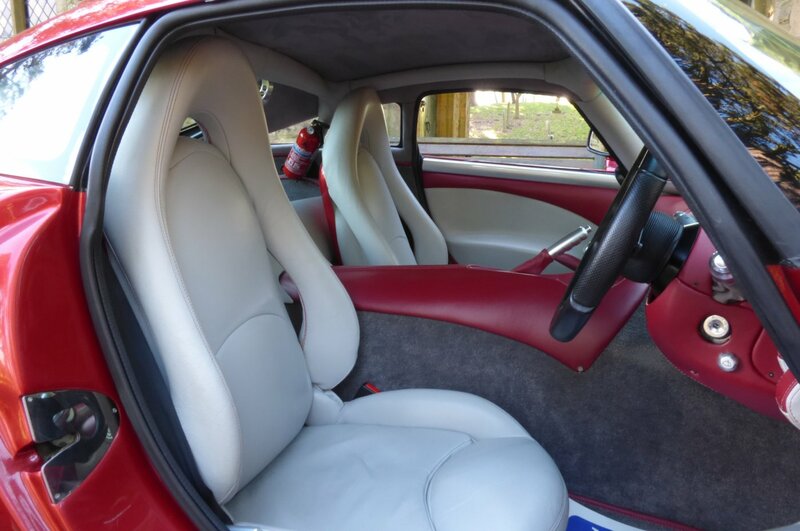 From Factory Build This Example Is Finished With The Portland Ivory Leather Sport Seats Beautifully Complemented With The Red Twin Needle Stitch Detail, The Optional Sagaris Embossed Body Colour Coded Seat Backs, The Two Tone Portland Ivory & Red Leather Trimmed Dash That Wraps Around This Unforgiving Space, Grey Carpets Detailed With Red Piping, The Two Tone Portland Ivory & Red Leather Bound Door Cards, The Three Spoke Black Leather Trimmed Steering Wheel, The Light Grey Suede Roof Lining, The Red Leather Trimmed Centred Tunnel, The Metal Turned Gear Shift And Hand Brake Lever, The Ivory Leather Top Roof Fitments And Beautifully Decorated With Metal Turned Switches That Finish This Highly Dramatic Environment Off Perfectly. 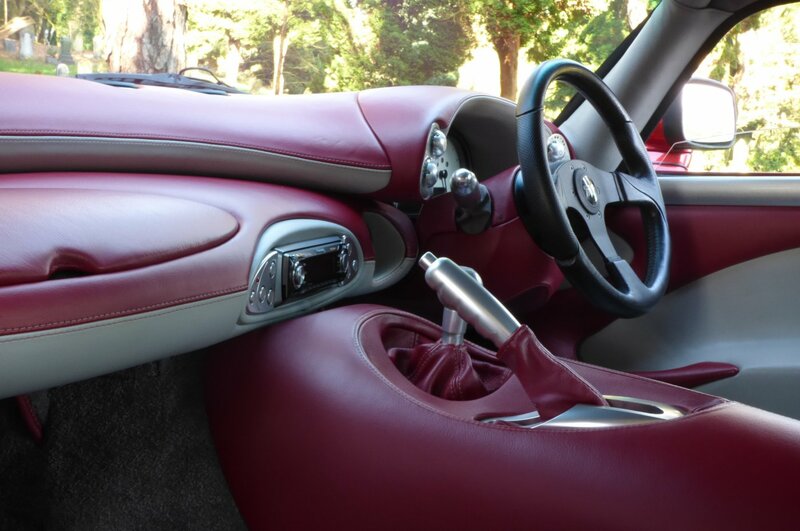 The Interior Offers Nothing More Than More Pure Excitement And Is A Difficult Animal To Tame, Even For The Most Experienced Drivers. 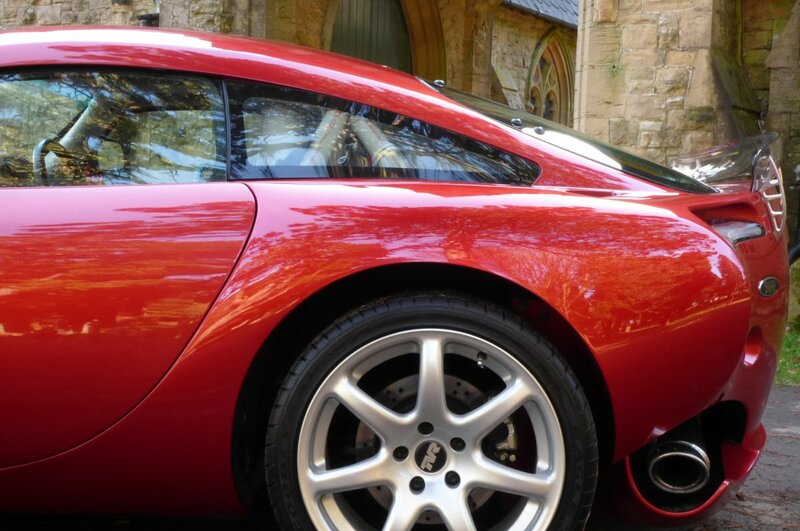 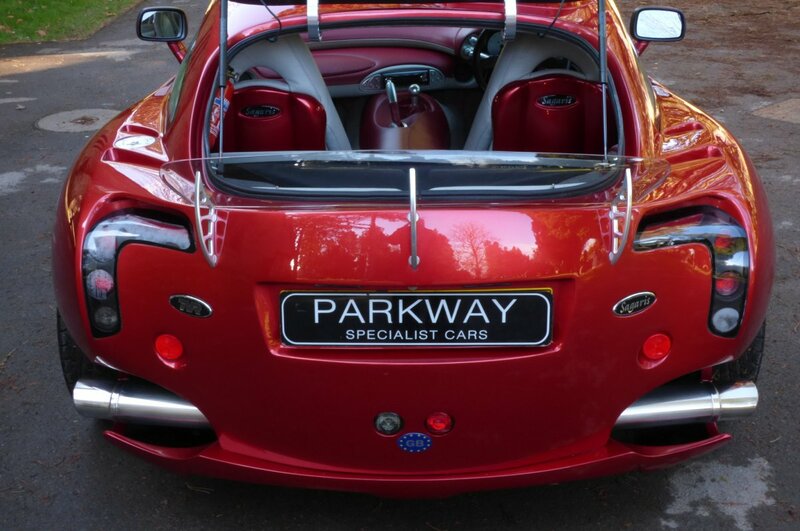 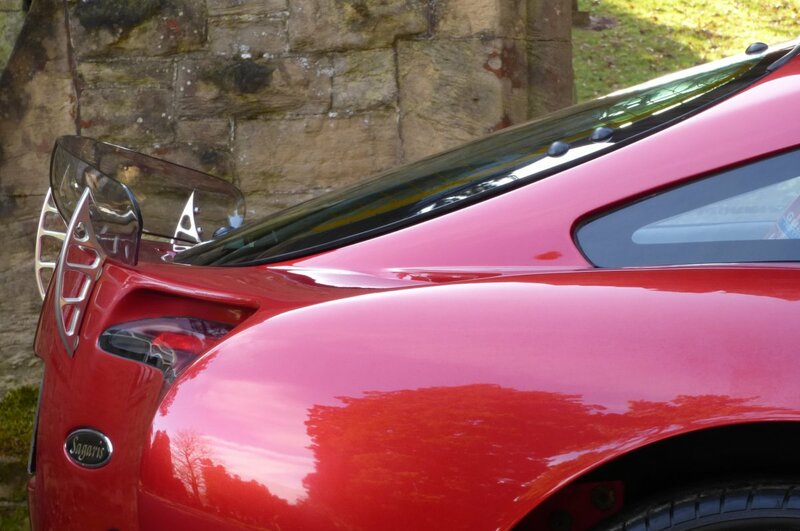 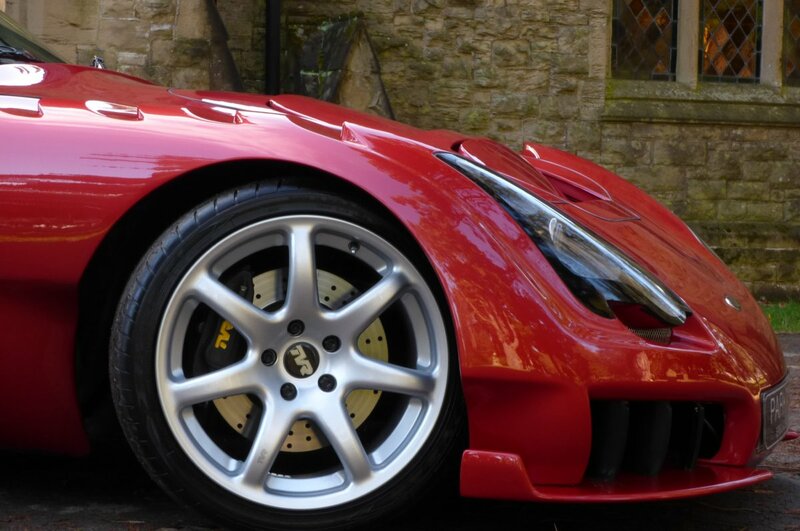 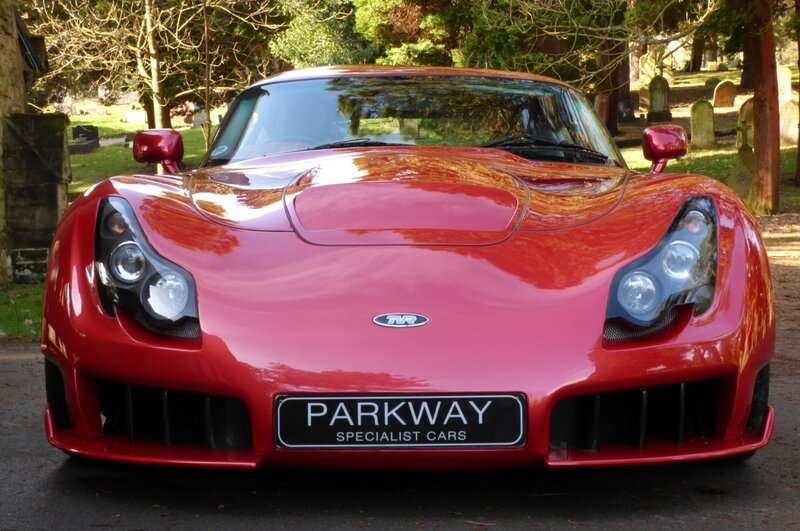 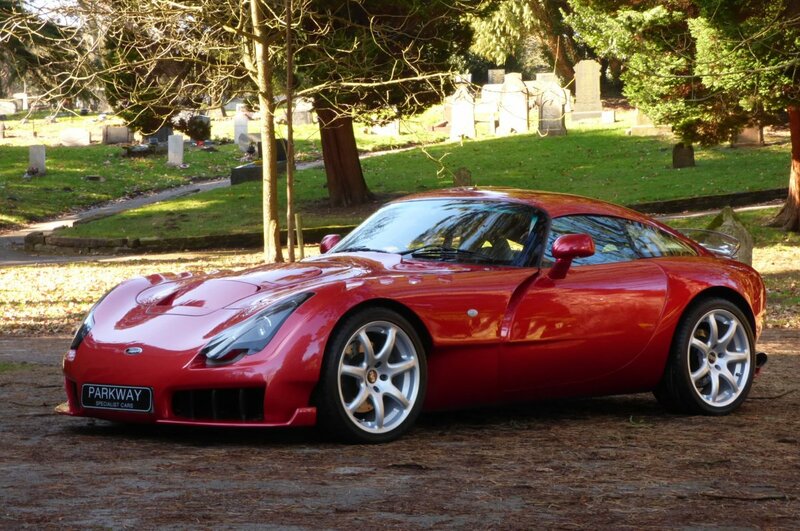 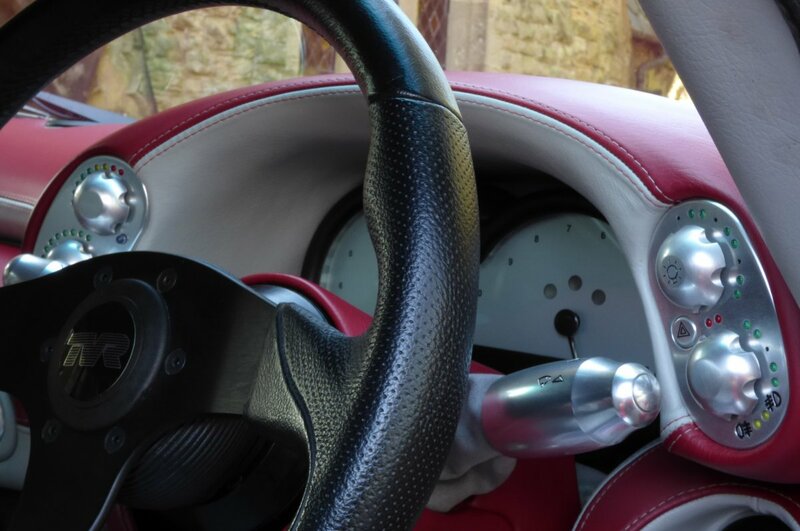 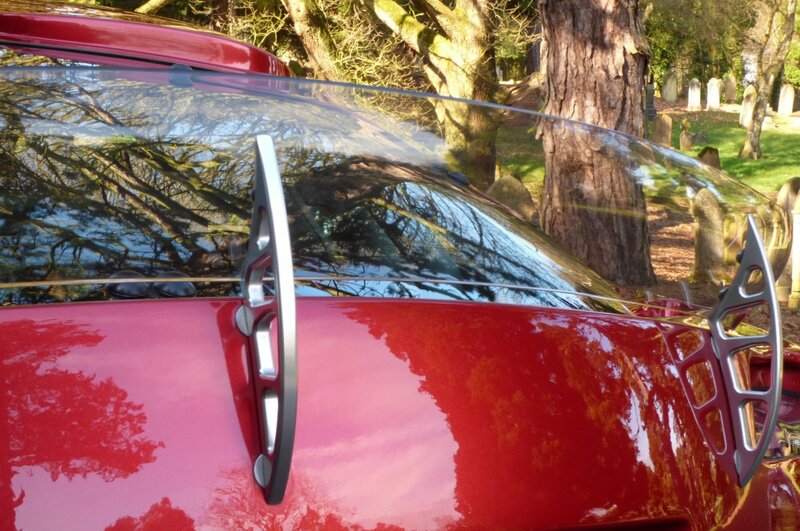 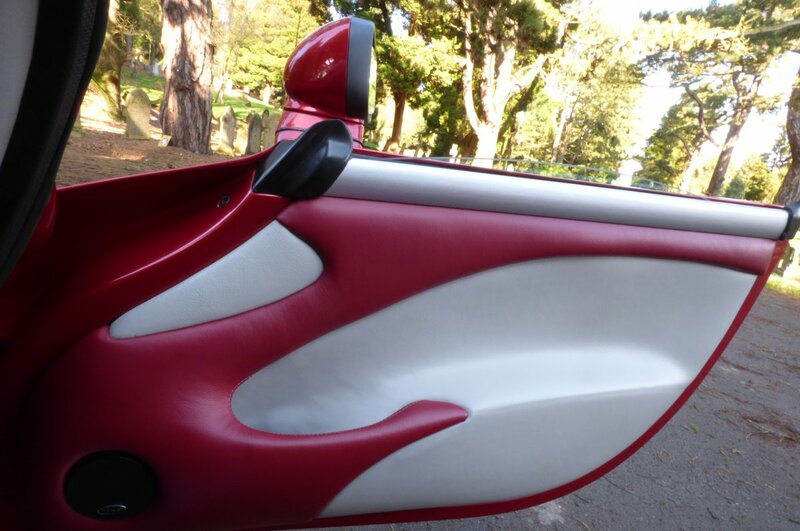 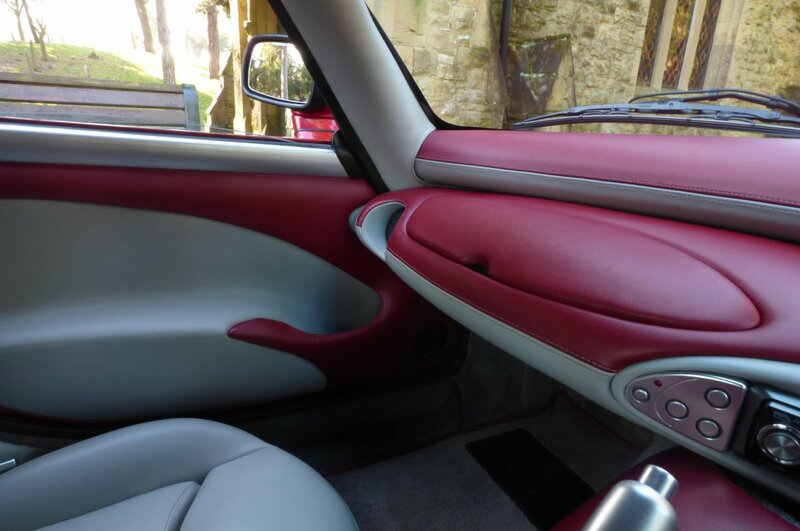 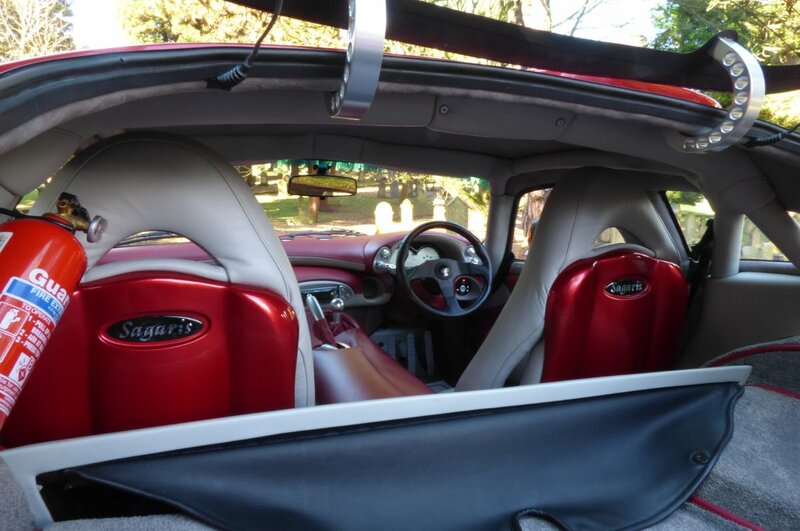 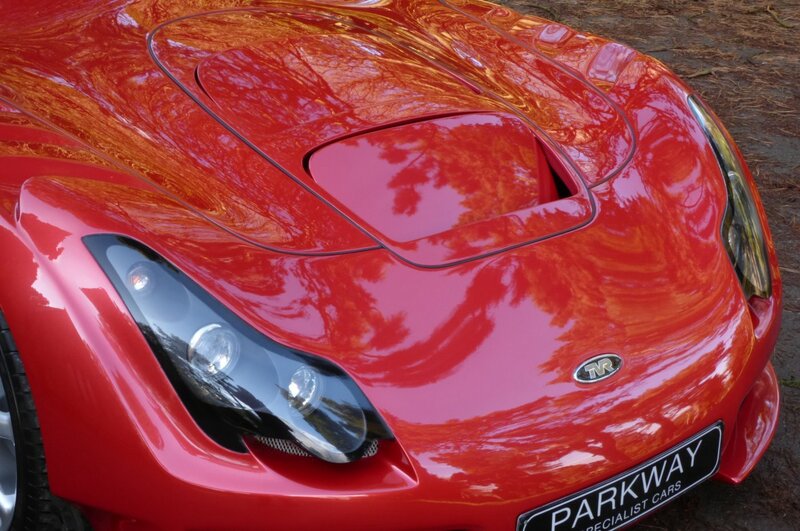 The Aggressive Sculptured Fibre Glass Body Is Presented In The Launch Colour Finish Of Red Glow Pearl, Which Is A Truly Fantastic Shade In Showcasing The Hostile Multiple Bonnet Vents, The Fabulous Sagaris Body Lines And The Now Famous Signature TVR Curves. 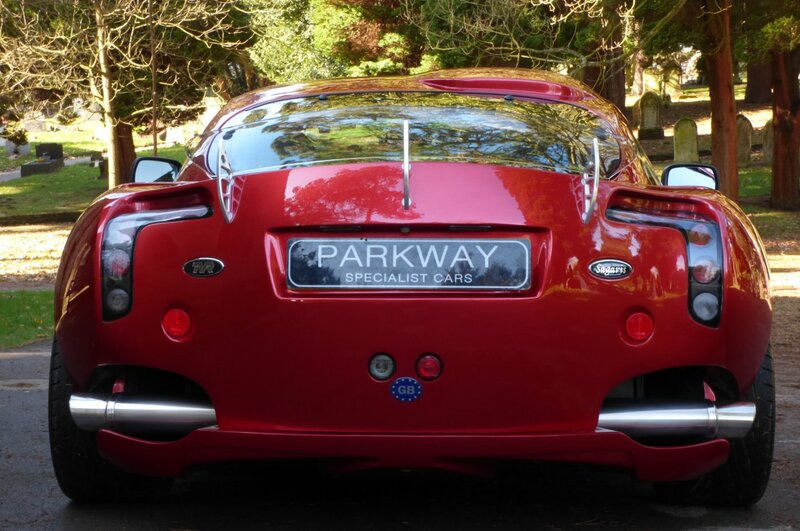 Further Prominent Features Include The Curved Bubble Roof Panel, The Unmarked Silver Finished 18" Severn Spoke TVR Embossed Spyder Alloy Wheels Which All Sit On Branded Tyres, The Twinned Chromed Right Angled Exhaust Pipes, The Colour Coded Front Bumper Valance Blades, The Aluminium Fuel Filler Cap, The Perspex Rear Boot Lid Spoiler Secured With The Metal Turned Brackets, The Blackened Brake Calipers Embossed With The Yellow TVR Script, The Colour Coded Door Mirrors Caps With The Door Entry System, Exterior Front And Rear Light Covers That Appear To Have Been Moulded From The Depths Of Hell And Beautifully Finalised With The Signature TVR Motifs, That Should Warn Off Other Road Users. 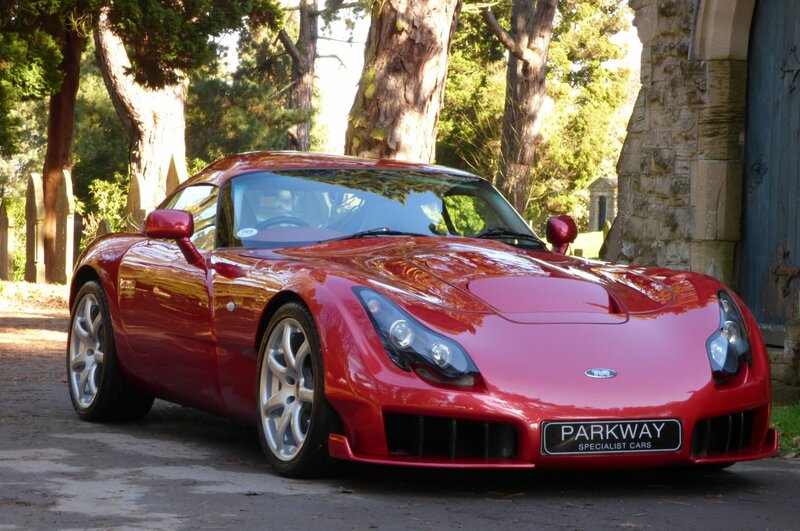 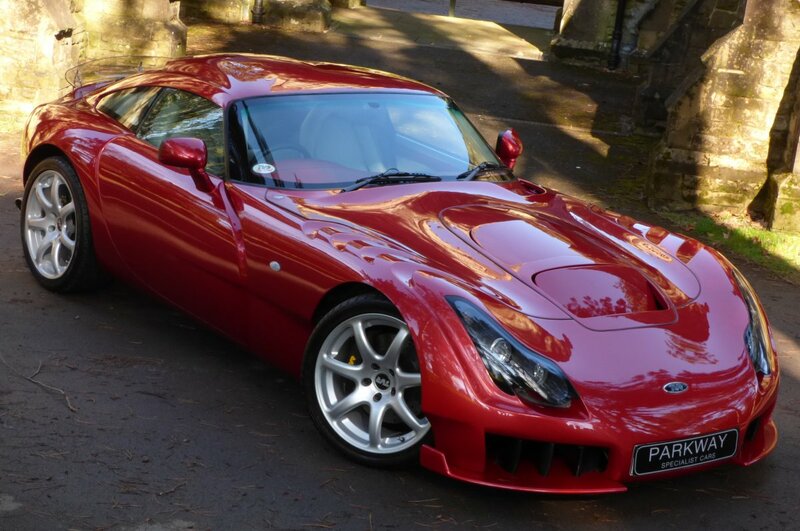 The TVR Sagaris Is Possibly The Most Aggressive Looking Vehicle Ever To Have Been Conceived By Man, With The Total Appearance Being Effortlessly Beautiful From Every Given Angle And With This Would Be Well Placed In A New Or Already Established Vehicle Collection. 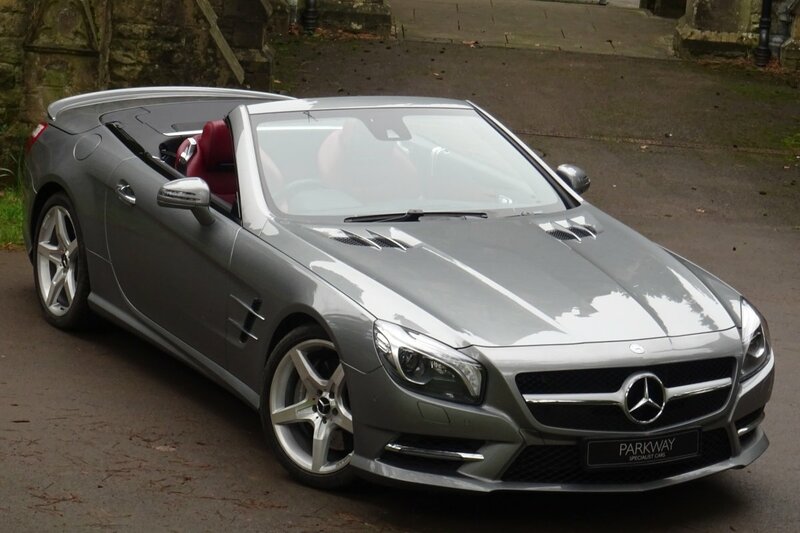 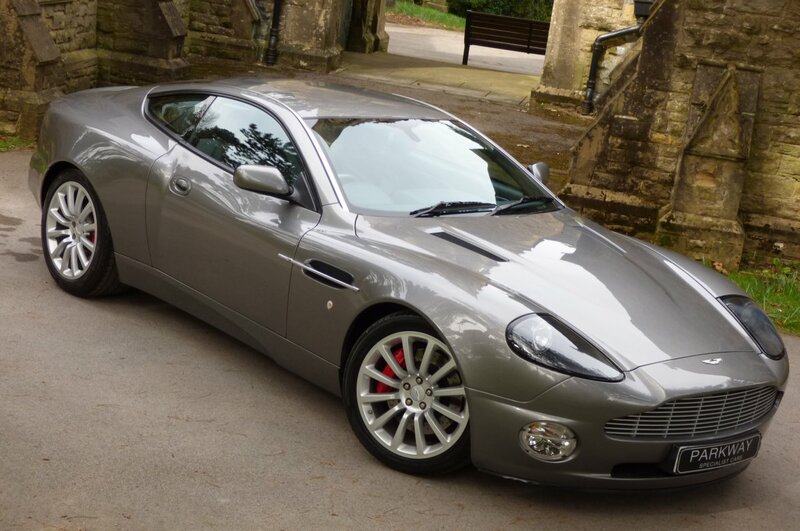 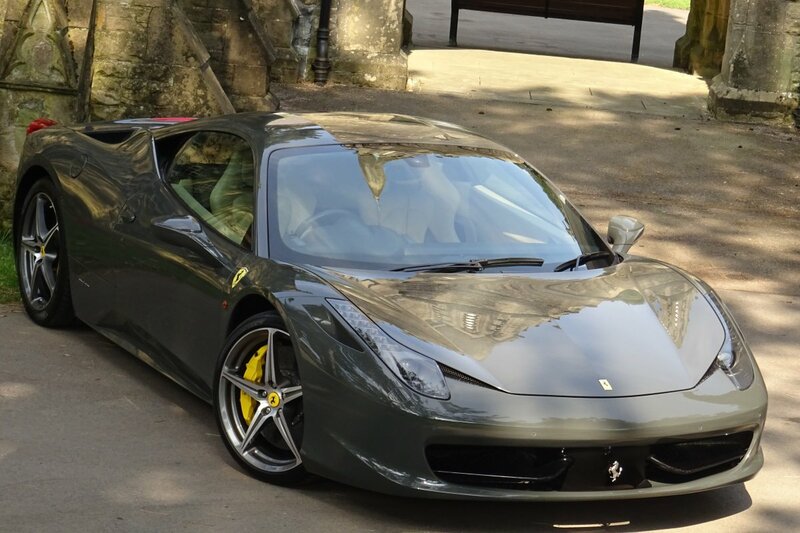 We Are Delighted To Have Available For Sale On Our Current Vehicle Inventory This Rare One Owner Low Mileage Example. 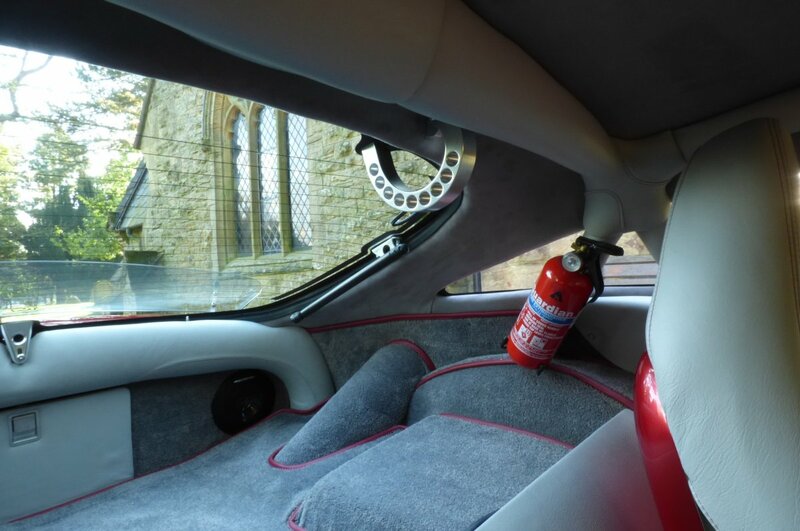 Chassis Number B001204 Was Opted From The TVR Factory With Options To Include The TVR Close Ratio Gear Box, Air Conditioning, Electric Windows & Mirrors, The Three Spoke Black Leather Trimmed Steering Wheel, The TVR Pearlescent Paint Finish, The Aluminium Fuel Filler Cap, The Unmarked Silver Finished 18" Severn Arm TVR Embossed Alloy Wheels, The Blackened Brake Calipers Embossed With Yellow TVR, Remote Central Locking With Alarm, Tracker Vehicle Tracking System, Xenon Headlights, Metal Turned Gear Selector, Sagaris Embossed Entry Door Sill Plates, Metal Turned Hand Brake Lever, NXT Speaker System, Pioneer Head Unit With CD Function, TVR Metal Pedals, The Twinned Chromed Right Angled Exhaust Pipes, The Perspex Rear Boot Lid Spoiler, A Fire Extinguisher And So Much More. 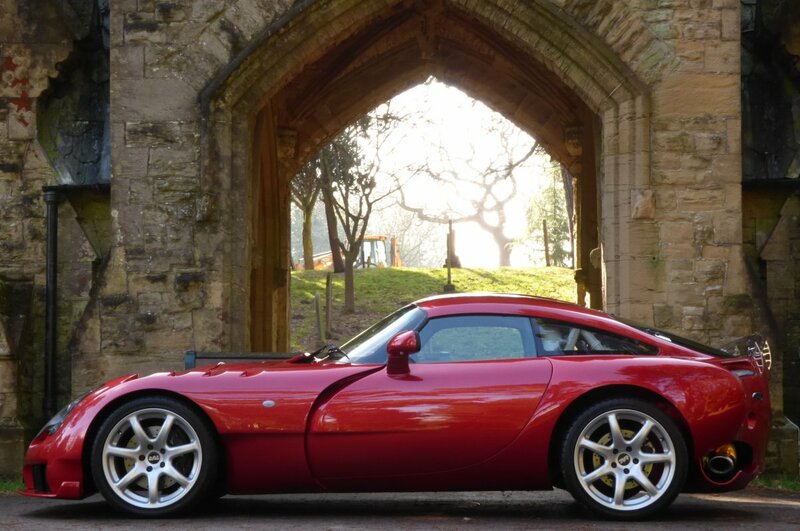 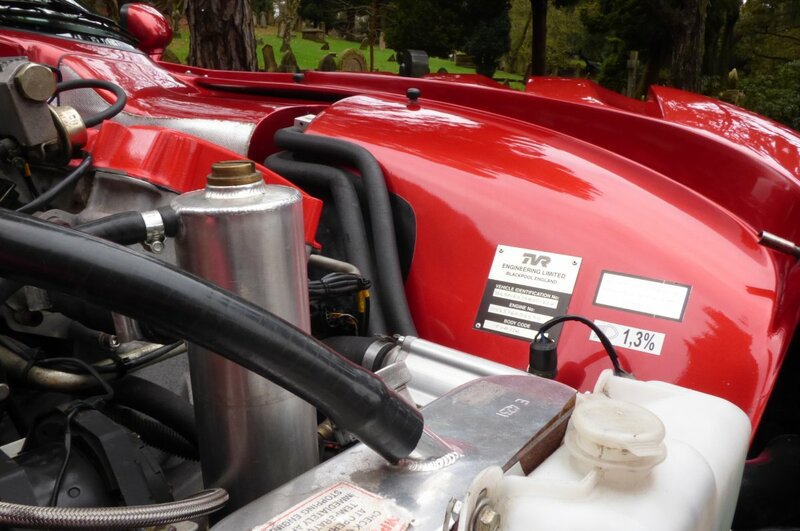 Presented With The Entire Booklet Pack Set, An Extensive Past History File, A Full Key Set, A Fully Cleared Hpi Report, The Original Bill Of Sale From TVR And The Original Factory Images Of Build..